Vanessa Ashley Rousso was born on the 5th February 1983 in White Plains, New York USA, and is of French and American ancestry. She is best known, by her stage name Lady Maverick, for being a professional poker player and she is considered one of the best female poker players in the world, as well as one of the sexiest. Have you ever wondered how rich Vanessa Rousso is? 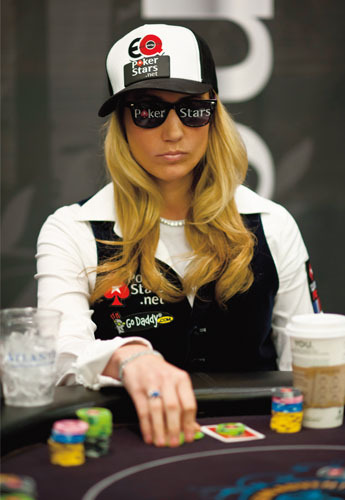 According to sources, it is estimated that Vanessa Rousso`s total net worth is $4 million, an amount mostly gained from her poker winnings, however, in adding to her net worth, Vanessa has also acted as a spokesperson for GoDaddy, an internet domain name, and has also featured in a number of editorials of famous magazines, including Sports Illustrated and Maxim. As three-year-old, Vanessa Rousso moved with her family to France, but when she was 10 years old their parents divorced and she moved back to the USA, so she has dual citizenship. She showed her intelligence at an early age through making the Dean’s list – high achievers – and was very interested in game theory, the Rubik’s Cube and chess, while she was at the Duke University, but when she discovered the theory of poker she was completely fascinated. Then she wanted to enter poker tournaments, but she was quite young, so she started to play poker online and that was the start of raising her net worth. However, she graduated from Duke University after just two and a half years, the shortest time to graduate in the history of the university, with a degree in economics and political science. She later studied law at the University of Miami, but dropped out to start playing live poker, the beginning of her career. In 2005 Vanessa went to Atlantic City to turn a $250 win into $17,500, allowing her to enter the World Series of Poker for the first time that year. From that point on, her career has only gone upwards; the same year, Vanessa won the No Limit Hold`Em Summer Series, held in Las Vegas, Nevada on June 13, making it her first win in a professional poker event. The next year, Rousso pushed her career to the next level, as she won $285,450 with a first-place finish at the 173-entrant $5,000 no limit hold ’em event at the 4th Borgata Open, on the 13th September. Also in 2006, Vanessa had three in the money finishes in the World Poker Series, finishing respectively 80th in a field of 1068 in Event 4, $1,500 Limit Hold’em, 63rd in a field of 824 in Event 5, $2500 Short Handed No-Limit Hold’em, which finally paid off for hours and hours studying the poker game. Vanessa became more and more frequent in the finishing rounds of tournaments, increasing both her popularity and net worth. Throughout 2007, Rousso lined up success after success, finishing 2nd at the World Championship of Online Poker, her highest earnings in her career by that time, as she won $700,782.50. In 2009, Vanessa won the 79-entrant 25,000 Euros EPT High Roller Championship, which had a first prize of 720,000 Euros, but in the finals, contestants decided to chop chips at 420,000 Euros, and Vanessa ended with 570,000 Euros in her pocket, which was estimated at $750,000 and broke her previous record. Her total earnings are estimated at just a bit over $3 million, which put her in the top five women poker player. In addition to her media popularity, Rousso also appeared in the 17th season of the reality TV show “Big Brother” in 2015, and finished the contest as third. Regarding her personal life, she was married to Chad Brown from 2009 to 2012, who is also a poker player; actually, the two met at the final table of the $25,000 April 26, 2006 World Poker Tour event. However, in 2015, Vanessa has announced an engagement with her girlfriend Melissa Ouellet. 1 In 2003, just two and a half years after starting her college education, Vanessa graduated from Duke University with a Bachelor's Degree.